A triathlon more fit for princes and kings the Mira Boat Club offers the ideal location for a triathlon in CBRM. For it's inaugural event the Triathlon on the Mira will offer try-a-tri, sprint and olympic distance triathlons as well as an option for teams. Enjoy a swim right off the Mira Boat Club dock, a short run to transition and a ride/run on Hillside Road, along the iconic Mira River. **NOTE** There will be no on-site registration. Registration closes at midnight on Friday July 27th to allow time to assign timing chips and prepare race kits/racks. Athletes may not use communication devices of any type, including but not limited to cell phones, smart watches, and twoway radios, in any distractive manner during the competition. Bib numbers must be worn during the run portion of the event. They are not required for the swim portion. Bikes will be numbered using seat tube stickers. Register by July 6th, 2018 to ensure your event t-shirt and swag kit. Registrants after this date are not guaranteed a shirt or swag kit. 7:25 - Pre-race meeting at transition area. All athletes required. The swim will take place directly off of the boat club wharf. Sprint/Olympic athletes will swim in a triangle keeping bouys on their right shoulder with Olympic athletes completing two loops. Super-sprint athletes will swim an out-and-back course totalling 400m. 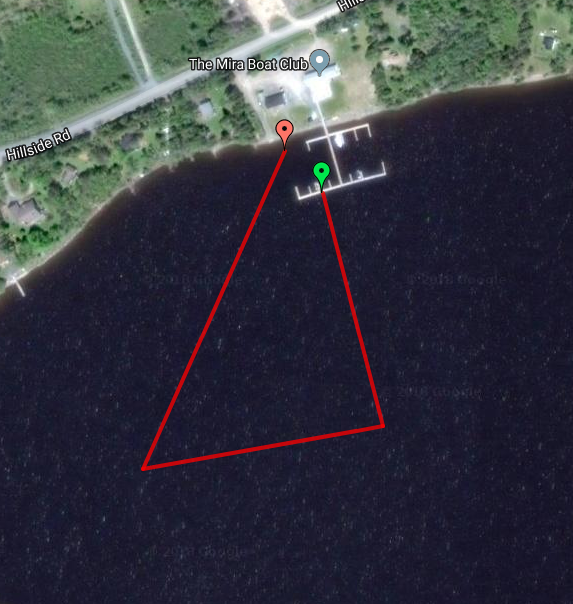 **Please note that the below map is a preliminary swim course and the course may be changed to ensure safety of competitors and maintain competitive integrity. Any announcements with regard to the change in swim course will be broadcasted at the pre race meeting. All athletes will exit transition and immediately cross the road, mounting the bikes and proceeding westerly along Hillside Road towards Marion Bridge. The run course will take place on the same road heading easterly. Super Sprint athletes will turn at 1.5km for a 3km run course. Sprint/Olympic athletes will turn at 2.5km and return to transition area. Olympic athletes will do this course twice. Water stops are positioned at the exit of transition 2, 1.5km, 2.5km 3.5km, 5km, 7.5km and 8.5km. There will be no parking in the Mira Boat Club parking lot. This is transition area. Event parking will take place across the street from the transition area. Please note that there will be limited access to this parking lot while the event is taking place between 8:00 am - 11:30 am.